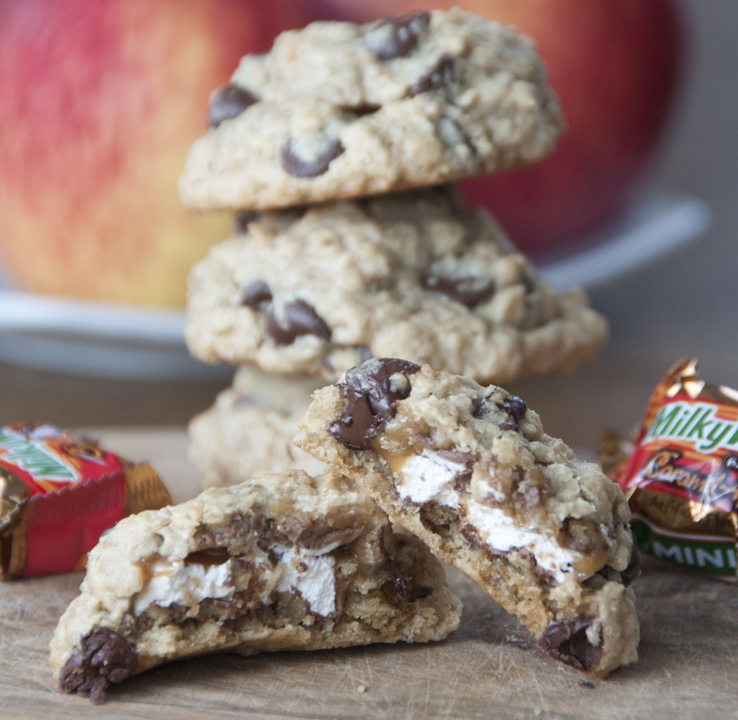 Ooey gooey stuffed peanut butter cookies with chocolate and caramel apple Milky Ways make an easy and fun cookie for fall or Christmas. Preheat oven to 350 degrees. Line cookie sheet with parchment paper or silicone baking mat and set aside. In a large bowl, cream butters and sugars together. Stir in egg and vanilla and whip until light in color and fluffy, about 2 minutes. Slowly stir in baking soda, salt, flour and oats until just combined. Stir in chocolate chips by hand. Using a cookie scoop, create 8 cookie dough balls on your prepared baking sheet. Press dough down flat. Top with a milky way bar and place another scoop of cookie dough over top. Press the dough around the Milky Way bar to enclose/cover completely. Bake 9-11 minutes or until cookie starts to turn light golden brown on the bottom. Cool 3-5 minutes before removing to a cooling rack.